This is a genuine Subaru EJ257 2.5 liter shortblock. This shortblock is standard equipment on the 2004+ US Market STi. The 2.5 liter block makes a great upgrade for all WRX models, since there is no replacement for displacement. The US STi block features a semi-closed deck for increased strength. This motor is physically a bolt-in for all US-market WRX and STi models (WRXes will require ECU tuning, bigger injectors, etc.). The 2.5L short blocks are build date specific. You will need to check your drive side door jam to determine which part number is needed to properly mate up to the heads. 2. The OEM 2.0L WRX heads will bolt-on for to the 06/2006 & before 2.5L short block, but there will be a bump in compression. 3. 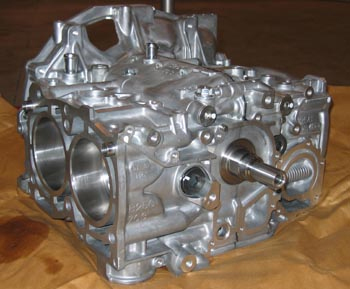 For high-powered applications, we recommend replacing the cast OEM pistons in this block with CP Forged OEM-size units.